Traveling is a very strange thing. For years you might dream of taking a break from your life and visiting the other side of the world, then when you get there you’ll realize just how much you miss the people back home. When you’re on the road it’s nice to keep in touch with your loved ones back home, so that you can let them know that you’re okay, tell them what you’re up to and describe to them all the amazing things you’ve been seeing. These days, thankfully there are lots of different ways you can get in touch with those back home. For example, you can call them on the telephone (using a cell phone, a pay phone or with Skype), you can email them or you can get in touch through social networks (e.g. Twitter and Facebook). Email is a great, quick way to send someone (or a group of people) a message. The advantage of sending emails over phoning home is that when you send an email, it’ll sit in the recipient’s inbox until they’re ready to open it (meaning they don’t have to be on their computer when you send it). When you phone home, however, they actually have to physically be there ready to answer the phone when you call. When you’re traveling half way around the world, you’ll be in a completely different time zone to the people back home, so by emailing them they can read your message when it suits them, and you won’t have to wake them up with a phone call in the middle of the night. These days, it seems that everyone you meet is on Facebook or Twitter (or both), so getting in touch with your friends and family through the medium of social network is a doddle (providing you can find a computer with internet access). They’re free to use, so if you bring your own laptop (and you can find a free WiFi connection) you won’t have to pay anything. Social networks are only good up to a point, however, as sometimes it’s nice to hear the person’s voice you’re communicating with (instead of just reading what they’ve typed). An increasing number of people seem to be taking cell phones with them as they travel, as local SIM cards can be bought for next to nothing and allow travelers to make cheap phone calls. Having your own cell phone when traveling means you can call home anytime you like. It’s also a handy thing to have in an emergency, or when you meet up with other travelers you’ve met on the road. That being said, calling back home from a cell phone (even if you’re using a local SIM) will still be ridiculously expensive. One of the downsides of taking a cell phone traveling with you is that you’ll never truly feel like you’re ‘off the grid’. Many people go traveling to take some time off from their life back home, but if you’re instantly accessible (through your cell phone) you might never feel like you’ve truly left your old life behind. For many travelers (especially those who like to bring their laptop along with them), Skype is a godsend, as it allows you to make free phone (and video) calls to other Skype users (provided you have a WiFi/internet connection). As you travel you’ll find that most internet cafés have all their computers set with Skype on them (and a headset for you to speak into), meaning it’s easy to call home with Skype even if you don’t want to bring your laptop along with you. With Skype you can also make phone calls (from your computer) to landlines or call phones, although you’ll have to pay for it (typically between $0.02 and $0.20 per minute). So what’s the catch? The only real downside of using Skype is that you need a pretty decent internet connection to make calls with it, so if you internet connection is slow you won’t be able to understand the person on the other end. Although a lot of hostels offer free WiFi these days (which is handy if you want to use Skype), the speed of their internet is typically very slow (because a lot of other people will be using it). This can therefore affect the quality of the signal (especially when making video calls). Nick Smith writes about how to volunteer abroad for free at WorldInhabit.com. You can find him on Twitter as @WorldInhabit. Skype and cell phones are definitely my main tools for contact when I’m traveling. It is a good idea to just buy a new SIM card instead of the whole darn phone. 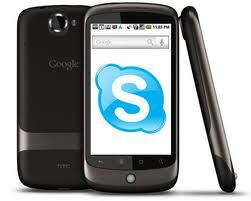 Skype is like the greatest thing ever for travel. It is free as long as you have the internet and you can call with it or do the whole face to face thing. I think that the fact that it is free is just wonderful.